‘ZTC’ fully automated discovery, installation, commissioning test and provisioning process. The FCM9004 can be deployed wherever managed service demarcation is required at the customer site. The FCM9004 supports standards compliant OAM functions and wirespeed loop-back with layer-2 address swapping, so that end-to-end service performance measurements can be initiated from within or across the core network. 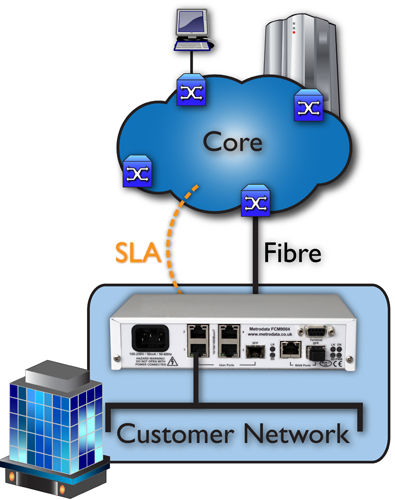 A number of physical connections are offered for both copper and fibre (SFP). The FCM9004 can be used for service demarcation for a wide variety of Carrier Ethernet services, including E-Line, E-Tree and E-LAN. Multiple traffic types and flows can be supported, with VLANs configurable for service separation and prioritisation used to ensure that mixed traffic flows are handled appropriately. Support for multi-level tag processing also eases core network configuration issues. The sophisticated performance measurement functions offered by the MetroSAM service assurance management hardware means that full service level parameterisation can be performed on installation and SLA verification and reporting offered to the customer. 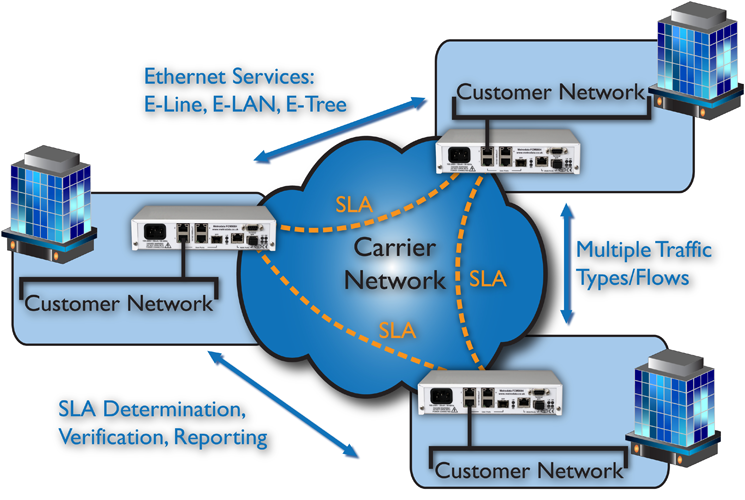 The majority of Ethernet Service Providers today are in fact ‘Aggregators’, offering end-to-end connections supplied on a wholesale basis, potentially sourced from a number of different Infrastructure Carriers. Whilst those Carriers may offer discrete Service Level Agreements (SLAs) for their portions of the network, the aggregator must assure their service from end-to-end, right into the customer premises. In these deployments the FCM9004 is flexible enough to offer true SLA network performance measurements which will include the entire multiple Carrier infrastructure, even if the third party service specifically filters out OAM packets. The FCM9004 has sophisticated and flexible Layer 2 Control Protocol policy management supporting either the filtering or pass-through of a wide variety of packet types including vendor proprietary L2CP frames. The FCM9004 supports auto MDI/MDIX cross-over switching on the copper interfaces, autonegotiation and the transmission of 10k byte Jumbo frames. To ensure quick fault detection, the FCM9004 supports Link Loss Forwarding, whereby a network fault can automatically force a link down on the user ports to indicate to the attached devices that there is a link problem. The FCM9004 is a powerful & versatile Ethernet Demarcation/Network Interface Device (EDD / NID), offering cost-effective copper & fibre demarcation for Carrier Ethernet Service Providers. Support for 802.3ah Link OAM (EFM) and 802.1ag Service OAM (CFM) enables Ethernet service management and monitoring right up to the customer delivery point. Y.1731 performance monitoring and advanced wirespeed SLA measurement and verification functions combine to enable Performance-Assured Ethernet (PAE) Services. Comprehensive circuit provisioning and in-service monitoring is facilitated via our unique ‘MetroSAM’ service assurance management architecture. The FCM9004 offers a sophisticated but cost effective demarcation solution for Ethernet Service Providers, with flexible interface options. The ‘MetroSAM’ service assurance architecture allows wirespeed measurement of the key parameters necessary to ensure compliance with customer SLAs. These measurements can also be performed in-service against programmable thresholds to prove that the service continues to operate effectively over the longer term. This proactive fault detection assists in the rapid isolation of potential service problems enabling SLA assurance whilst reducing operational costs (OPEX). The FCM9004 supports Metrodata’s ‘zero-touch-commissioning’ (ZTC) process, minimising both on-site installation time and the Engineering skills required. This auto-provisioning process reduces on-site installation to a ‘plug and play’ exercise, simple enough for the end user to perform themselves, i.e. simply checking that the Ethernet LEDs indicate correct physical connectivity. The EDD auto-discovers its management connection, IP address and TFTP server, then downloads its individual service definition parameters and management system contact details. The EDD then performs a carrier specific series of SLA measurements to micro-second resolution and proves that all of the service parameters have been provisioned properly. Once the service has been fully proven, the EDD sends the SLA verification birth certificate to the NOC for inclusion into the Service Provider’s provisioning documentation and then auto-provisions itself. Subsequent in-service SLA verification measurements then continue to check that service levels are being maintained and notify of any drop in performance below a set of programmable thresholds. The FCM9004 has a highly programmable ITU-T Y.1564 / RFC-2544 performance benchmark testing capability on-board which can be scripted to match the specific installation procedures of individual Service Providers. Full CIR/CBS/EIR/EBS testing can be performed on multiple flows simultaneously with microsecond resolution using hardware timestamping. The ‘zero-touch-commissioning’ (ZTC) process enables full service installation and end-end SLA verification without requiring an engineer to attend site. Should the EDD suffer a loss of power then a Dying Gasp 802.3ah message and Trap are sent to provide immediate notification of the reason for service loss. All of this functionality combined with the sophisticated inservice SLA verification against programmable thresholds, dramatically impacts on the Total Cost of Ownership (TCO) of Ethernet Service Provision.